Throw a pebble in a pond, and the ripples in the water extend out. A friend stands on the shoreline next to you, throws a pebble, the ripples in the water move and intersect the ripples from the other person's actions. 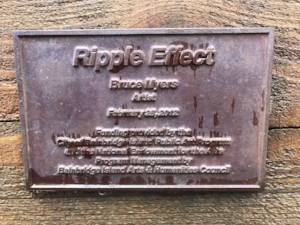 Project Peace this year was about the ripples. Choose peace. Your peaceful actions will extend to reach others. It grows and grows and grows. So many times we think "I'm only one person. How can I make a difference?" To this I say, "you can make a difference." Never doubt the power of simple acts of peace. There is power in peace. The back story on the design. The idea for this year's shawl had been in my head for months...actually since Project Peace 2016. I wanted a design that would capture the ripples in the water after the pebble was tossed in. It was to be a crescent-shaped shawl so that the ripples would look curved. I had a few other criteria... the shawl needed to be accessible to most knitters, be peaceful to knit, and could be adaptable to any type of yarn, e.g. fiber type, weight, or color (solid, tonal, speckled). I had many projects to complete before I could sit down to work on this but I knew it would fall into place because I had it all figured out in my head. It was going to be easy. I gave myself 3 months to get the shawl finished... in my world that's light years’ worth of time. On a walk, it came to me. That yarn didn’t want to be that shawl. And my mental image, well maybe it was just a launching off spot. So, I let go of that yarn and that design shape. I opted for a shape (asymmetrical triangle) I knew would be easier to knit, found a different yarn, and said good-bye to having a shawl that looked like ripples in the water, or so I thought. Half-way through the new shawl shape, I realized the intended effect was still there and perhaps even better than the original idea. The shawl begins with a single point representing the person standing on the shoreline with the pebble, the ridges get farther and farther apart as the shawl grows and radiates outward. The border design was simply a fancier set of ripples. Now I was that person in the literature class that said “really, you think the author meant all that? We're overthinking this; they wrote a story and let’s not analyze this to pieces.” So yes, what I've put forward here is what I intended. What I didn't anticipate was how many incredible interpretations that others generated as a result of the project. I love how some have the perspective that the body of the shawl is the larger body of water, the ridges are waves and the border is the frothy waves as they hit the shore. Genius! I also took delight when someone on the Ravelry group said the finished shawl looks like a pennant and the shawls are peace flags. And this is why there are peace flags in the village where Candace and Penny reside. I never expected the community that would develop on the Ravelry group and how the meaning behind the shawl grew. Again, letting the yarn and process speak to you. Someone offered the advice that the ridges don't have to occur in a structured way. Let the ridges fall where they are and not view it as a mistake. Some adapted the shawl to better suit their needs which is perfect... isn't that what cultivating peace is all about. Find something that gets you started and adapt it to your situation. After last year's Project Peace, I began to notice symbols of peace, acts of peace, opportunities for peace everywhere I went. My eyes were opened to a new way to look at life. I experienced a shift that brought me out of my own world and I began to see how I could play a bigger role in doing right in this world, a world that needs a little extra kindness and compassion. My story about Penny and Candace was truly inspired by the 21 days of Project Peace. If you re-read the story, you'll find mention of knitting, walking, trees, the water, listening, and an orange. Ultimately I wanted to write a story about how we are treating the earth. Penny was the earth... she gave, and gave, and gave until there was very little left to give. How long will we continue to take, and take, and take from this gracious planet we calll home. Candace represented so many of us seeking ways to help but not knowing what to do because we're so busy trying that perhaps all we need to do is stop and listen to what's in our hearts. And then, there was so much more to the story as written by others. I loved the renditions that were provided. They brought me to tears. First, I need to take a break. I'll be resting up for the next couple of weeks. This past semester (my day job) has been extremely taxing, rewarding yet draining. I need some time to sit by my tree, make Christmas cookies with my daughter, wrap some packages, and take some walks in the woods. Second, I'll be back in the New Year with some more ideas, patterns, actions, peace-writings, etc. Mark your calendars for Project Peace 2018. I already have the theme, the pattern concept, and have commissioned the artwork. So, November 15, pattern info will be available on Ravelry and we'll begin on December 1. Yes, it's a busy time of year but if we always wait for a less busy time to embrace peace... we might be waiting a long time. Third, it is my hope and wish that all of you will carry forward our message of peace into your lives. Peace is active and not passive. Peace is a journey and not a destination. Peace is your choice and not something that will be given to you. Keep your eyes open for symbols of peace, acts of peace and opportunities for peace. You'll begin to see it everywhere. On my recent trip to Seattle, I made my way to Bainbridge Island to visit the iconic Churchmouse Yarn and Tea shop. As I walked down the street, I saw the most amazing artwork in the sidewalk. I stopped to take photos of the magnificent detail. 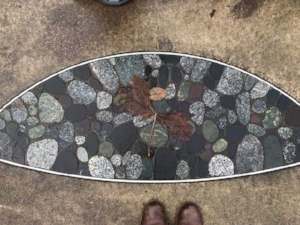 My friend who was watching me stepped back and looked down the street and said "it's kind of like the ripple effect." I looked up and said "wow, it is." Here are the winners (3 winners of yarn from KnitCircus and 1 winner of a LightShine candle). Please send me an email (thehealthyknitter@gmail.com) and I'll let you know how to receive your prize. "This peace journey for me has involved noticing and embracing my slow pace and mistakes. I am in awe of knitters who have already finished." "WOW - that was a beautiful ending - I am going to print it out and send to my closest friends and family women. It is the true meaning of fellowship, peace, and love. Thank you for sharing and for allowing all of us to experience happiness and a "piece of peace" in our homes, sitting by the lamplight, knitting alone or with others, and finding that we can survive this world with inner hope and resilience." Peace to me, at this point in my life’s journey, is the ability to tune out the daily stressors, pressures, and my internal monologue (often critical of myself and others and just BE. Being in the moment is something I’ve been working on lately and that is what I’ve been meditating on while I’ve been knitting the ripples in my shawl. Peace to all of you. Thank you for sharing this journey with me.